Simple slides and drives can be devised in your own shop using standard components available from Sherline Industrial Products. Using an accurately marked handwheel on a threaded rod of known pitch provides precise control over linear movement. These nicely machined and finished components will also add a professional look to your designs. 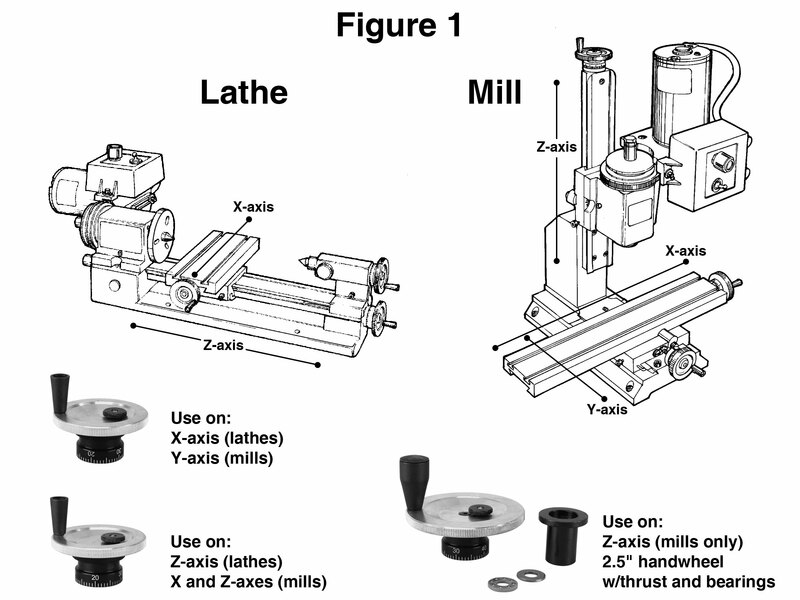 Components for backlash adjustment are provided when ordered with a leadscrew. If you want to go the next step to automated control, take a look at the stepper motor driven leadscrews near the bottom of this page. The inset photo shows a 2" diameter adjustable zero handwheel being used to drive a small slide. (Click on image for a larger view). Figure 1 (Click on image for a larger view). 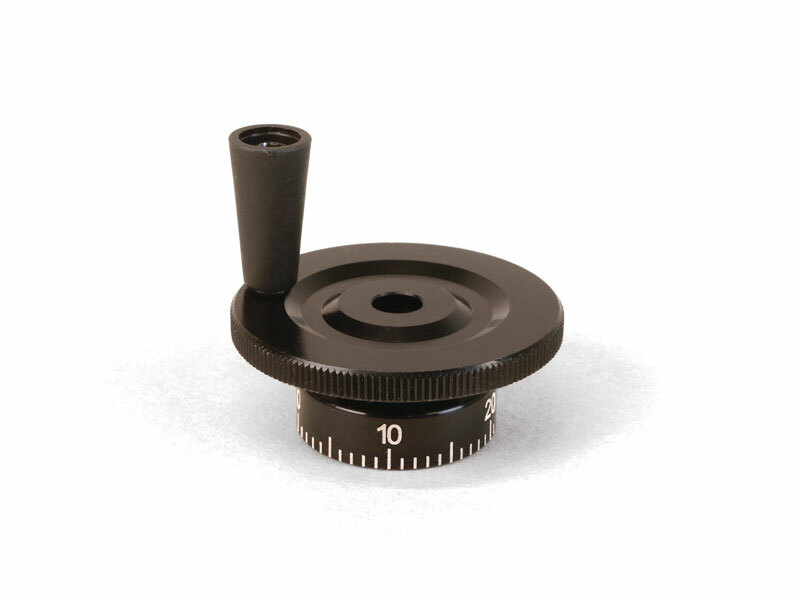 Sherline handwheels are designed to be used with a 20 TPI leadscrew and are graduated in 50 increments, each representing .001" of movement. In their simplest form, they could be attached to a cut-off 1/4-20 bolt or threaded rod to drive a simple mechanism with a relatively high degree of accuracy. 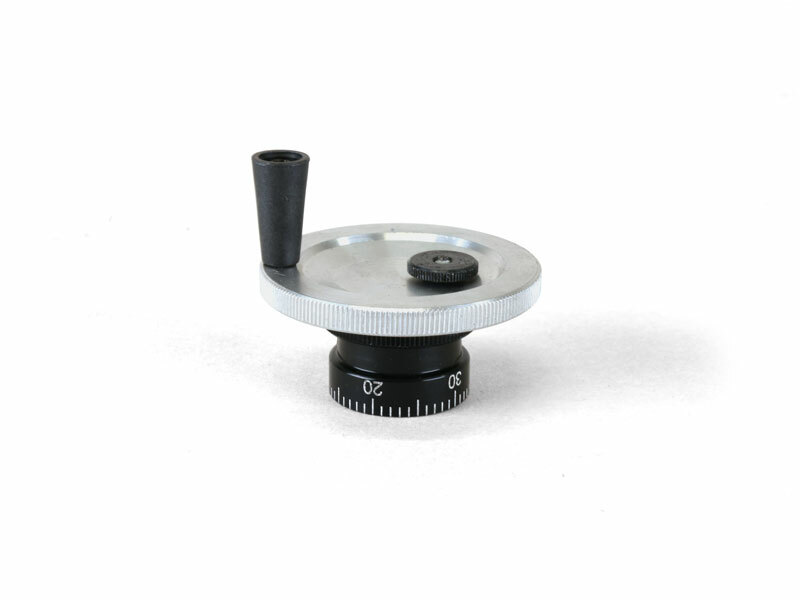 Metric versions are also available with a 1 mm pitch and are marked with 100 divisions. In this case each division represents .01 mm of movement. 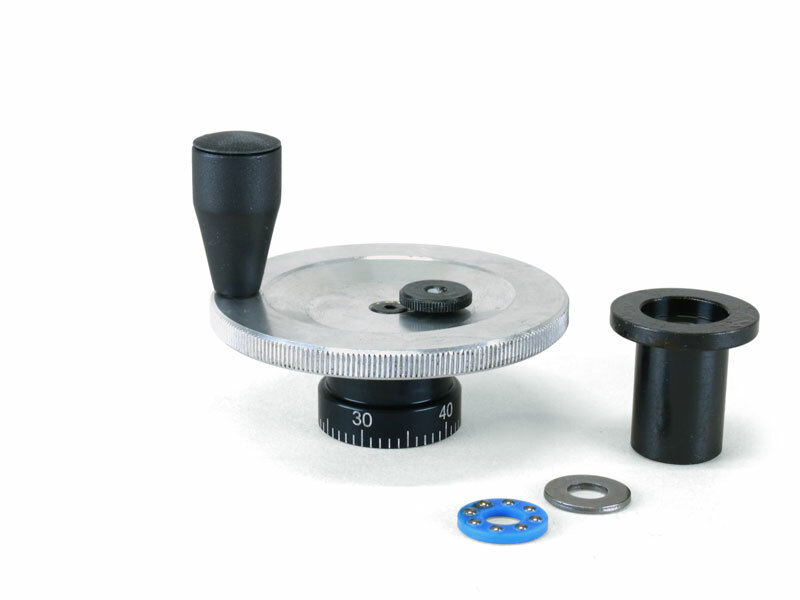 The handwheels can be used on threaded stock, or greater accuracy can be obtained using precision rolled leadscrews available from Sherline (See next section). 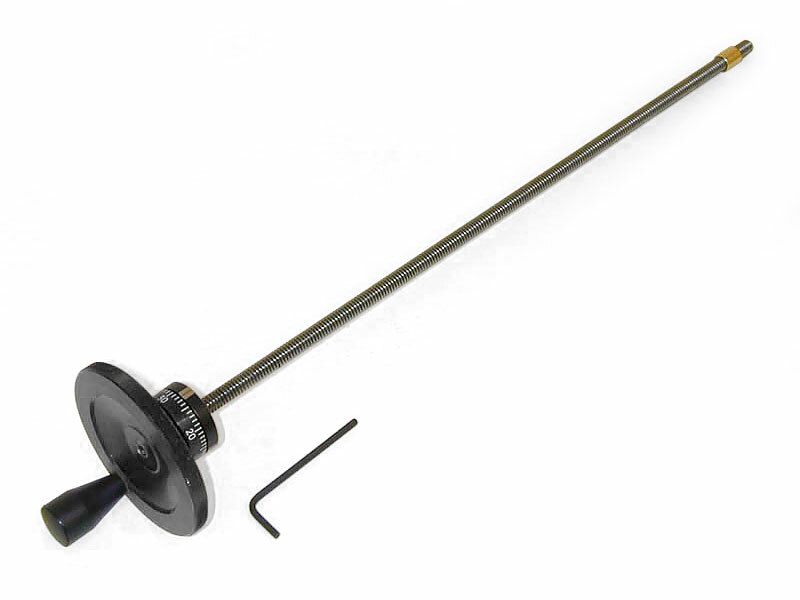 The black handle rotates on a pin, making for smooth operation. A knurled outer surface gives good feel for fingertip control on fine feeds. The anodized aluminum handwheels offer a high contrast to the laser engraved markings, making them both accurate and easy to read. 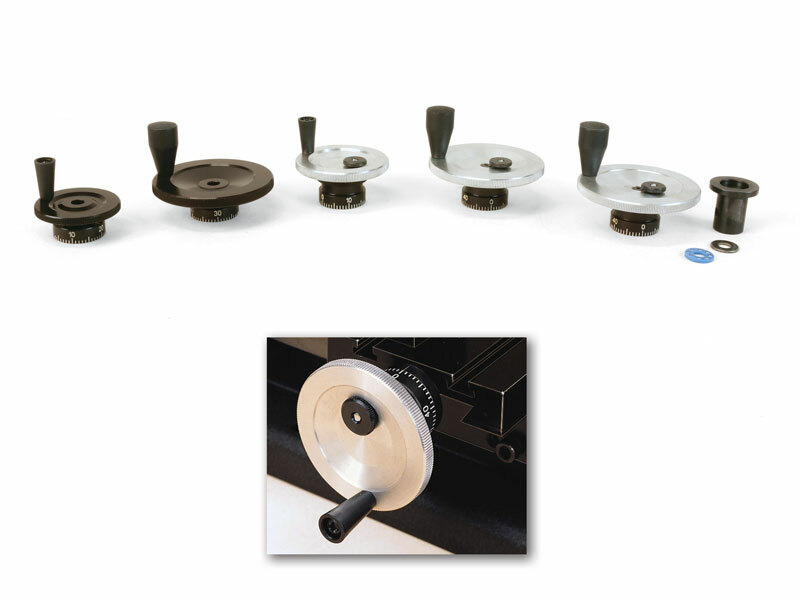 In the photo on the left, shown from left to right are a 1-5/8" standard handwheel, a 2-1/2" standard handwheel, a 2" deluxe adjustable handwheel, a 2-1/2" deluxe adjustable handwheel, and a 2-1/2" adjustable mill Z-axis handwheel with thrust collar and bearings. All are available with either inch or metric leadscrew pitch and corresponding handwheel increment markings. The engraved numbers on the handwheels are oriented differently for ease of reading depending on the axis on to which they are mounted (See Figure 1). For example, if you mount a handwheel designed for the mill X-axis on the mill Y-axis the numbers will appear upside down. (Click on images for a larger view). 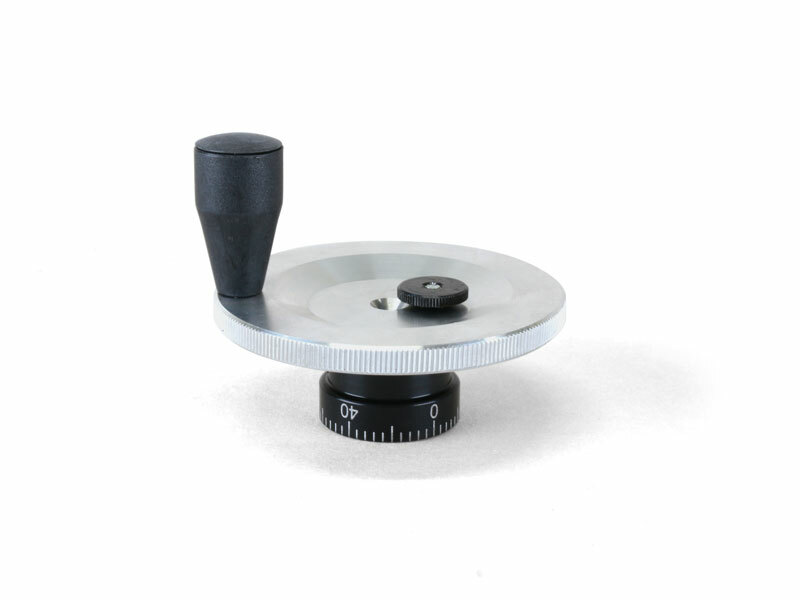 The 1⅝" handwheels are the standard handwheels that ship with many of our machines, including the lathe tailstock and our 4″ rotary table. The through hole accepts a .250" shaft, and a set screw is provided to secure the handwheel in place. 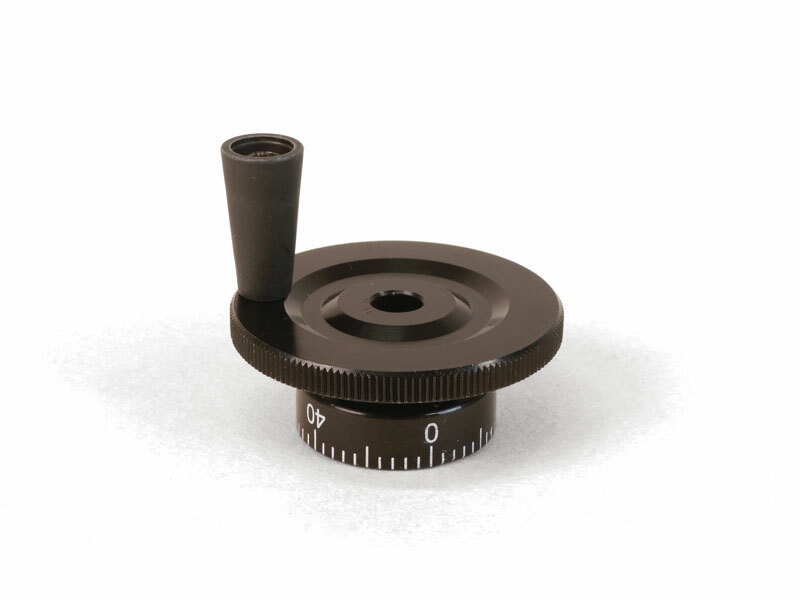 These larger 2½" diameter handwheels are graduated the same as the smaller handwheels provided as standard equipment with the lathe and mill. The larger size makes them easier to read and to turn, plus it offers a little more substantial "feel" when working with the tools. Deluxe handwheels are of the resettable zero variety with a lockable rotating collar. Releasing the knurled lock nut allows the graduated collar to be rotated without moving the handwheel body. The collar can be reset to zero (or any number) and relocked to aid in moving to the next setting with a minimum of calculation. (Click on image for a larger view). 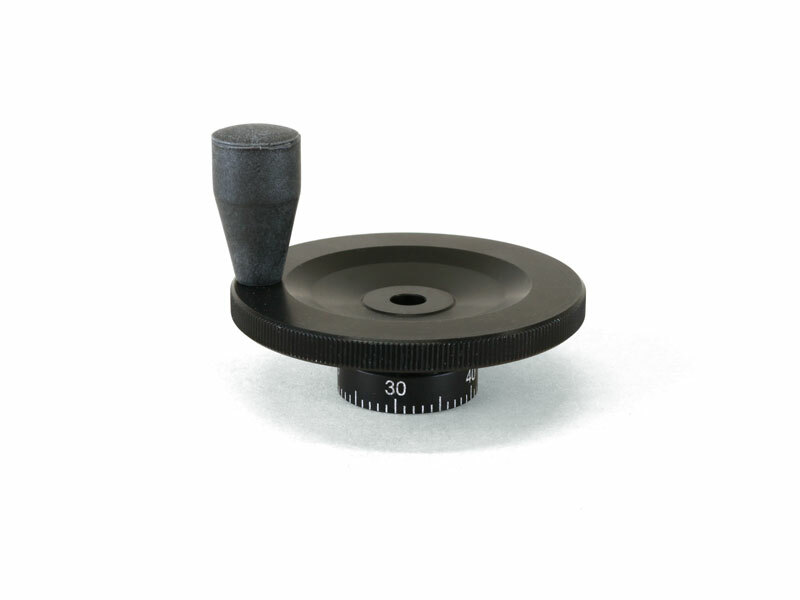 This special 2½" diameter handwheel is designed for use on the Z-axis of the mill or vertical milling column, and has a ball thrust bearing set to relieve the stress caused by the lifting action of the vertical Z-axis. Don't reinvent the wheel! If you need to move a small slide or object a controlled distance, these parts offer a convenient and economical way to do it with off-the-shelf parts. Sherline handwheels can be purchased as a set with a leadscrew of the appropriate thread, a thrust collar and a brass nut. The replaceable nut can be secured in a predrilled hole in the part to be moved using a set screw. (In place of the nut, the leadscrew could be simply inserted into a hole drilled and tapped with the appropriate thread in the part to be moved, although using the brass nut means the least expensive part is the one that is replaced when worn out.) The collar is attached to the fixed portion of your design with a single screw (provided). Also included is a backlash nut and a lock to secure it, which allows backlash to be controlled on the leadscrew if desired. 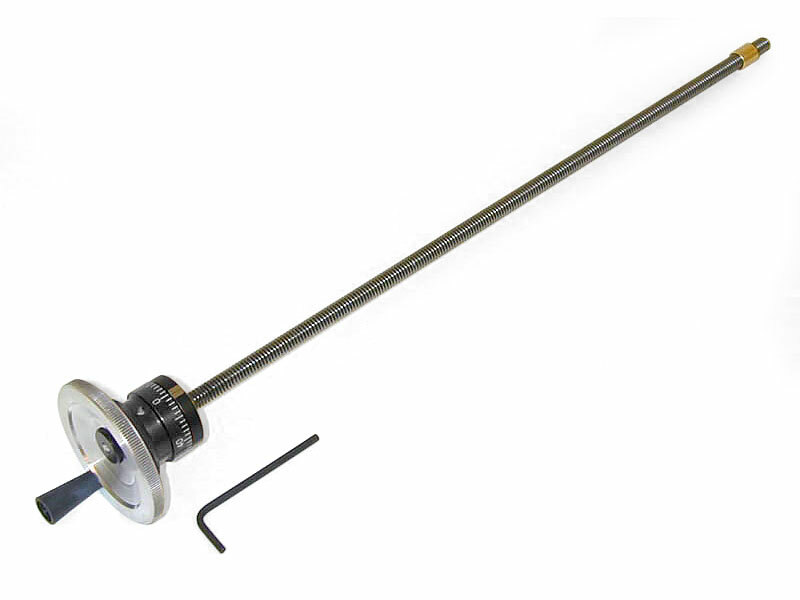 The leadscrew is over 11" long and is available in inch (1/4-20) or metric (6.3 x 1 mm) thread pitches and matching handwheel graduations. One rotation of the handwheel drives an inch leadscrew .050" while a metric leadscrew moves 1 mm. Inch handwheels have 50 graduations representing .001" and metric handwheels have 100 graduations representing .01 mm. A NEMA 23 frame size stepper motor can also be used to drive a leadscrew, in place of the handwheel. Included with the set is Sherline's stepper motor mount which features dual preloaded ball bearings to eliminate end play and a dampened coupling to smooth out the stepping action. 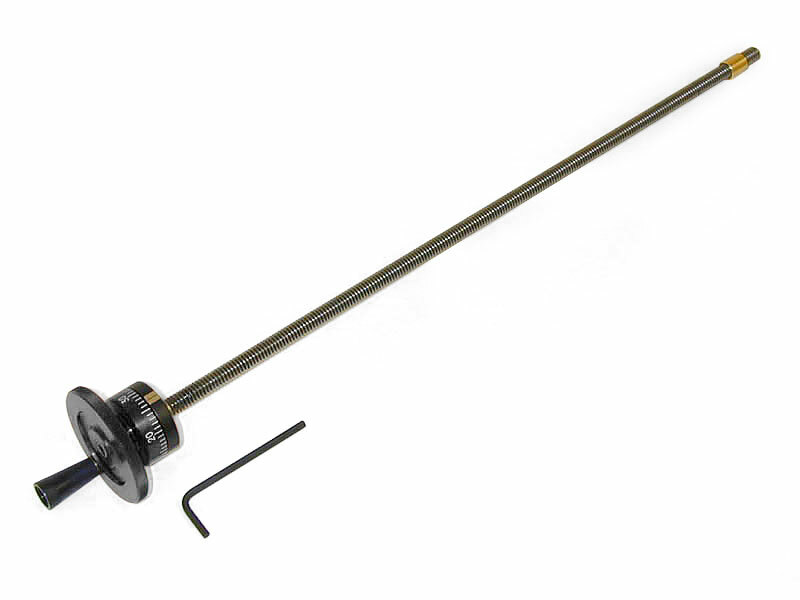 The 11" leadscrew is .250" diameter, precision rolled with 20 threads per inch. (Metric leadscrew with 1 mm pitch also available.) Also included is a matching brass nut and anti-backlash nut and lock. Mounting screws are provided for the stepper motor mount. Also included is a template drawing showing location of the mounting holes. 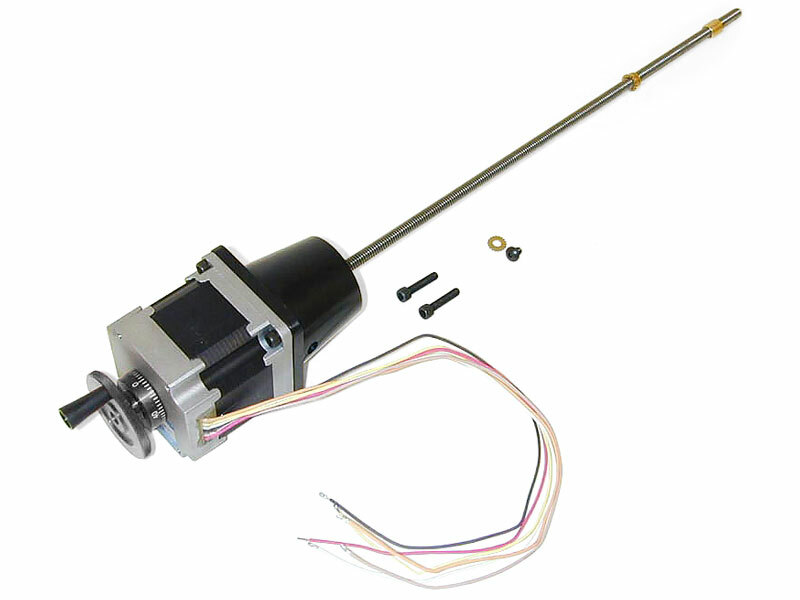 The stepper motor is a high quality 2 amp, 136 oz-in motor with dual shafts. The dual shaft design allows a Sherline handwheel (included) to be used for manual control over the leadscrew in addition to stepper motor control. The motor has six wire leads that allow it to be wired in either a uni-polar or bi-polar configuration using a CNC driver of your choice or design. The leadscrew nut and anti-backlash nut are shown threaded onto the leadscrew. The lock for the backlash nut is next to the leadscrew as are the two screws provided to attach the stepper motor mount to your fixture. (Click on image for a larger view). Simple CNC control over your slide can be achieved by using a stepper motor to drive the leadscrew. A handwheel is provided for backup manual control. If you don't have the capability, or you don't wish to provide your own CNC driver for the stepper motor/leadscrew unit, Sherline offers a self-contained controller that makes driving the stepper motor easy. The controller is about the size of a large handheld calculator. It is programmed by simple entry of commands right on its own keypad. No knowledge of G-code is needed, all entries are simple number values. An LCD readout cues the operator as to the sequence of the entries and reads out the numbers entered. The values that can be controlled are feed rate, distance, direction, and backlash compensation. Two programs of up to 40 blocks are available and can be held in memory. 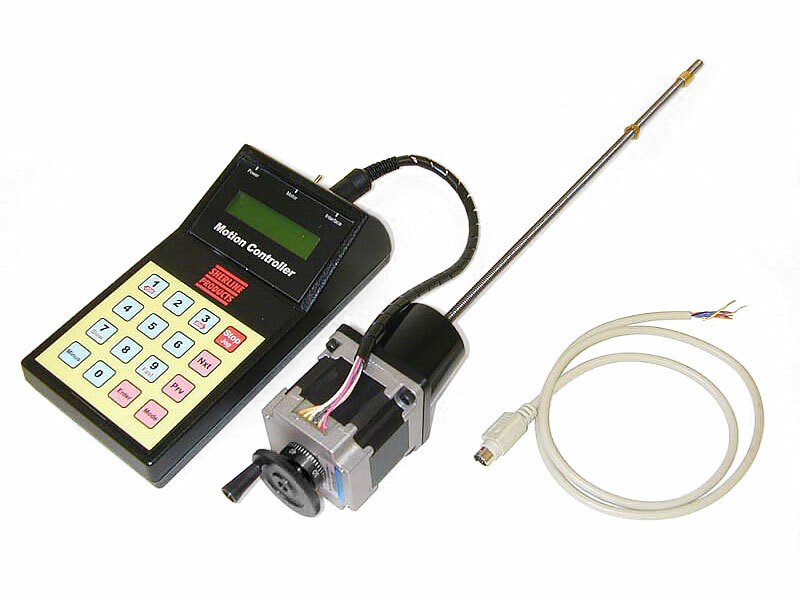 The controller can be activated by your push-button command, a limit switch or signal from another controller or CNC system. The motor can be run in either direction with no programming by using the "Jog" button on the keypad. The leadscrew is over 11" long with a 1/4-20 thread. Also included with the unit are a 110VAC power supply, mounting bolts, nut, anti-backlash lock and a cable for input from a limit switch or another controller. 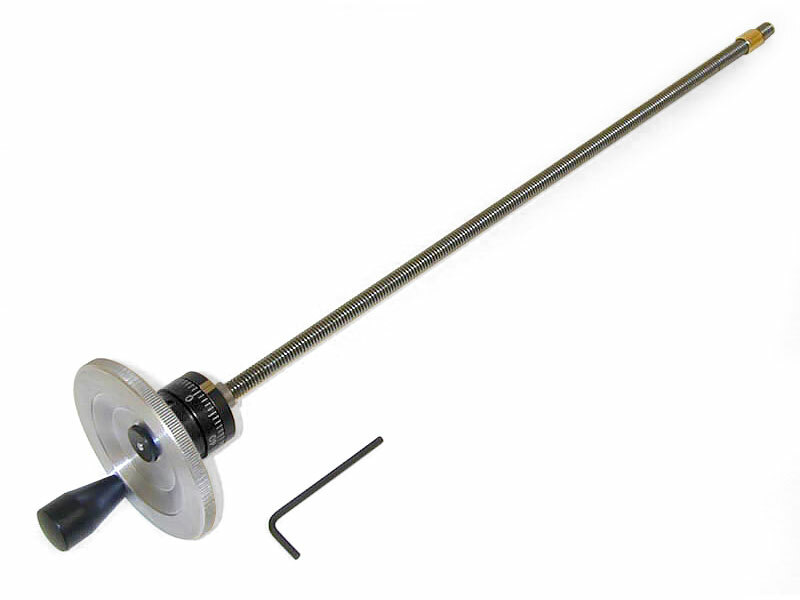 In 2012 a metric version of the controller was made available along with a leadscrew with a 1.0 mm pitch as P/N 6596. When combined with Sherline's P/N 8800/8810 programmable linear controller, you have a complete, self-contained single axis CNC power feed. Power supply, mounting screws and anti-backlash nut are not shown but are included. The extra cable is provided for activation with a limit switch or for "daisy chaining" with another controller.